-- Who do YOU pledge allegiance to? After exposing one of the most notorious rings of police corruption in history, lawyer Cruz Marquez planned on starting a new life south of the border. That plan unraveled when an extremist group of Minutemen captured and tortured him and his wife. Will Cruz pledge allegiance to do right, or will he do anything to serve up revenge? 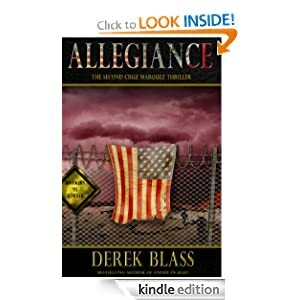 If you enjoy the action and suspense of a James Patterson book, the legal thrills of a Grisham book, and reading a book that challenges you to think, then Allegiance is your next thriller!